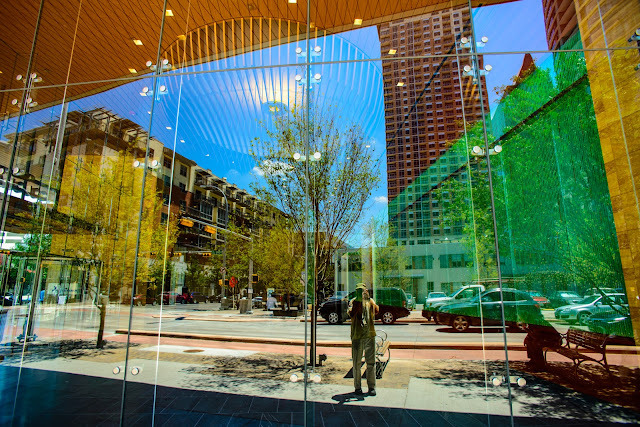 Having fun shooting art reflected in downtown buildings. Getting pissed off being harassed by the petty functionaries of the oligarchy. Photographer and downtown reflected in giant windows. It's been too long since I just put the office computer to sleep and headed downtown to take a walk and see what's new. After I retouched some portraits this morning and got a bid on getting the house painted I grabbed the favorite camera of the last few weeks (the Nikon D610 and Tamron 20-40mm) and escaped from the clutches of responsibility. I always tell myself that I'm walking to exercise my body, my mind and my eyes and that it's not important even to bring the camera to my eye. The camera is just coming along for the ride. It's there in case I see something that desperately needs to be photographed. By me. There was lots of context floating around downtown just not a lot of new, visual content. I was on the return leg of my usual loop when I came back to a big set of windows on a building called the Colorado Tower that I had first photographed earlier in the year. I can't see through the windows with the bright daylight outside and, frankly, I really don't want to. I use the windows a a giant, multi-dimensional reflector that shows everything around me and behind me as I shoot into it. I like the confluence of the blue sky, a green tinted wall somewhere off to the right and the repeating vertical lines. I snapped a sequence of handheld shots and then ambled off to the opposite corner of the intersection to see what the building would look shot at the widest setting of my lens.